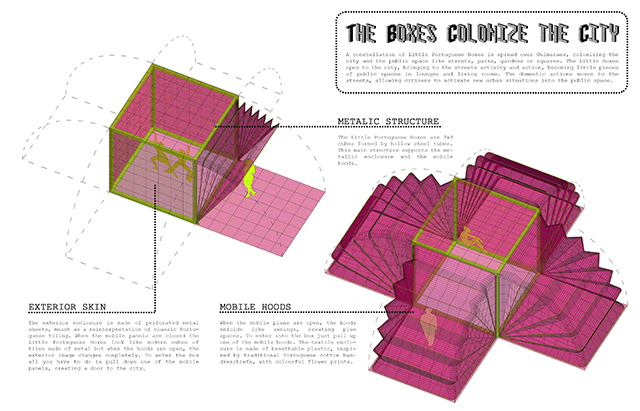 A constellation of Little Portuguese Boxes is spread over Guimaraes, colonizing the city and the public space like streets, parks, gardens or squares. 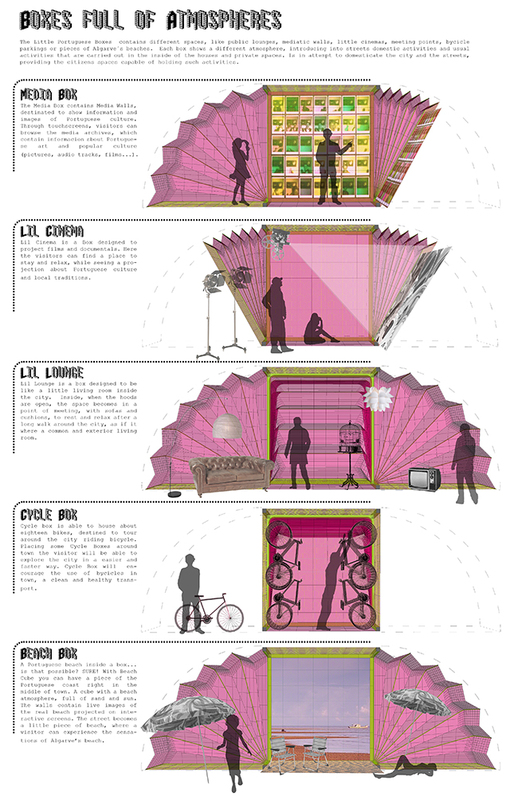 The Little Boxes open to the city, bringing to the streets activity and action, becoming little pieces of public spaces in lounges and living rooms. 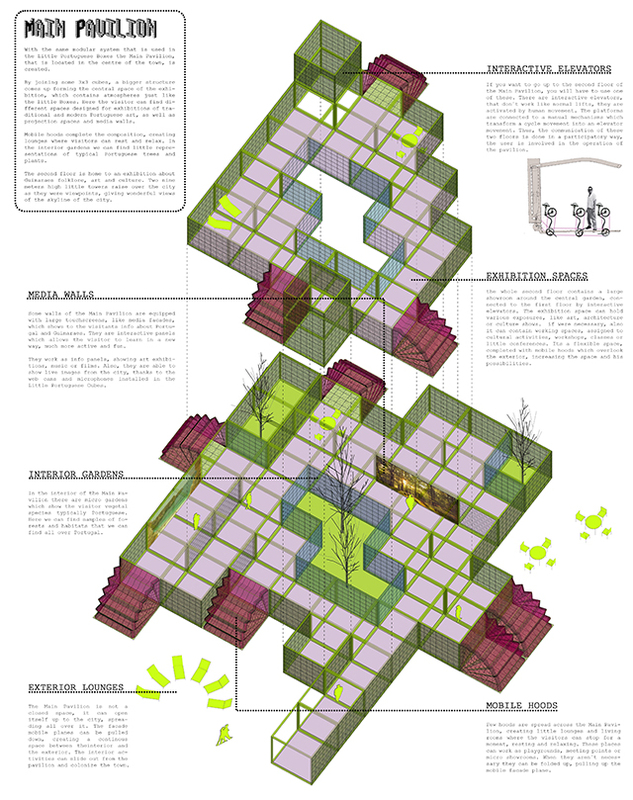 The domestic actions moves to the streets, allowing citizens to activate new urban situations into the public space. Some reinterpreted materials are used to wrap the Little Portuguese Boxes, with the aim of increasing the relation between the project and the external environment. Some traditional Portuguese elements are transformed and applied to new construction techniques to create specific and unique materials, closely related to the Portuguese tradition. The facade is inspired by traditional Portuguese tiles, which can be found in many buildings, as a sign of national identity, becoming a Portuguese icon. This pattern is applied to a steel plate, making drawings by micro perforations, creating a porous plate, that help to bring light and air to the interior. The mobile hoods are created with breathable plastic, which allows light into the interior and a visual connection with the exterior. The breathable plastic is semitransparent, made of a material with flower patrons, meant as a reinterpretation of classic Portuguese handkerchiefs, a traditional textile item applied to architecture. 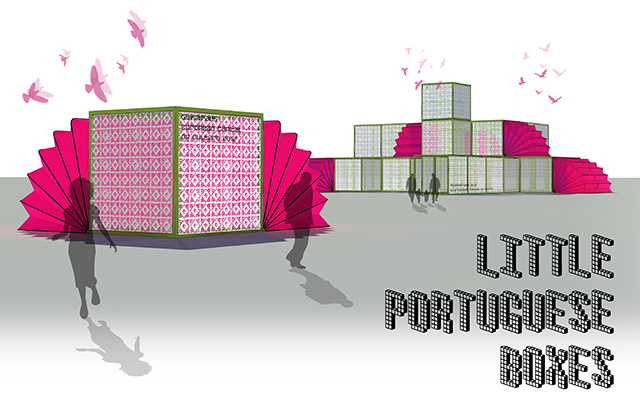 The Little Portuguese Boxes contains different spaces, like public lounges, mediatic walls, little cinemas, meeting points, bycicle parkings or pieces of Algarve´s beaches. 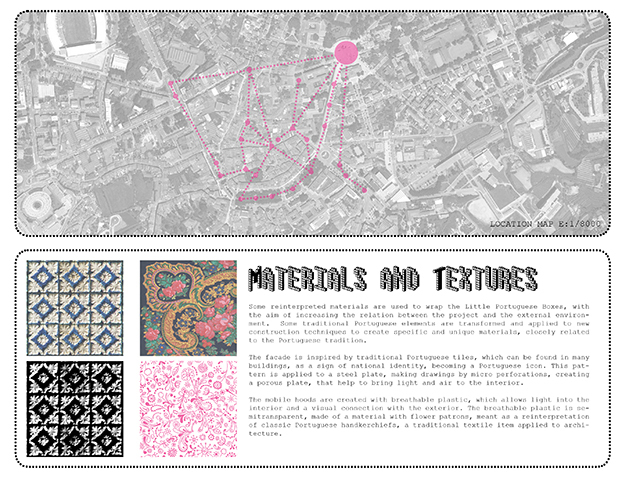 Each box shows a different atmosphere, introducing into streets domestic activities and usual activities that are carried out in the inside of the houses and private spaces. Is in attempt to domesticate the city and the streets, providing the citizens spaces capable of holding such activities. ¡AFTER EXPOSURE DON´T GET RID OF ME! When the summer will be over, the Little Portuguese Boxes can be sent to other countries like gifts, containing little pieces of Portugal: Algarve´s beaches, cinemas wich project Portuguese movies and documentals, or Portuguese info points . This would increase the interest in the country, working like an advertising along the world. Little pieces of Portugal will be flying around the world, creating relationships with other countries, showing how many different atmospheres has Portugal. Also, some of the Little Portuguese Boxes can remain on Guimaraes town, working like public spaces, containing domestic and daily activities, like public lounges spreaded all over the town.